7 Fun Fall Activities To Do With Your Dog! We humans tend to love the fall season and all the joys it brings our way. We love checking out the beautiful fall colors in trees and plants everywhere, picking pumpkins and apples, and savoring hot chocolate and apple cider. Did you know that your furry friend enjoys fall, too? Yes, it’s true! Share the joys of autumn with your dog by doing these 7 fun fall activities together. Take a Hike – The fall is the perfect time to explore some of your favorite hikes, trails, and national parks, so leash up your buddy and get ready for some fun! You and your dog are bound to enjoy the pretty fall foliage and all the great fall scents. Just make sure that your dog is properly treated for ticks and fleas before heading out, and you’re on your way to a fun, safe hike! Enjoy a Doggy Play Date – Sometimes fall can be a bit too chilly to enjoy outside. Your dog, though, can become bored without enough physical activity in his life. Why not invite a friend to bring their dog over for a doggy play date? Your pup can have a blast playing with their friend, wrestling and rolling around, and playing tug-of-war with toys. Best of all, you’ll have a ball just watching them (and you get to hang out with your human friend, too!). Toss Around the Ol’ Pigskin – Fall is all about football, so get in the spirit and toss a football around with your pup in the park! He might not be able to throw it back or score a touchdown, but he’ll have so much fun being your trusty retriever! If a real football is too big for your dog, you can always throw a plush football around instead. Enjoy Local Fall Festivals – Now that fall is finally here, the many different fall festivities will be taking place in neighborhoods near you! Several of these festivities take place outside, and many of them are dog-friendly. You can chat with friends and vendors while your pup socializes with other people and even a few new canine buddies. Just make sure that your pup is always leashed when you go! Play in Piles of Leaves – Remember how much fun you had jumping into a giant pile of leaves in the backyard? Your dog enjoys doing the same thing! 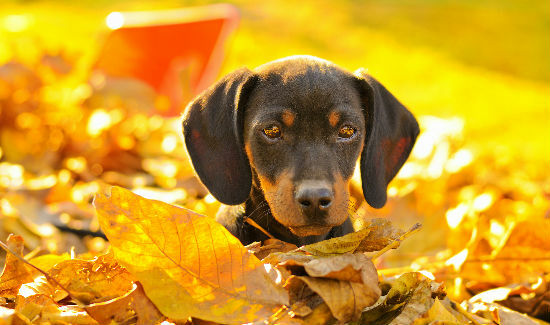 Rake up a big pile of leaves and prepare it for your dog to jump in! Be sure that there aren’t any sticks in the pile first before your buddy launches himself into it. Head to the Pumpkin Patch – Fall means pumpkins, so it’s time to head to the pumpkin patch with your favorite 4-legged buddies! See if the pumpkin patch of your choice allows dogs to come along, dress up your buddy in some festive garb (but don’t force her), and come along to pick out a pumpkin or two. Also, did you know that many dogs enjoy the taste of pumpkin? Try adding a scoop of pumpkin to your dog’s food to see if she enjoys it, too! And don’t worry – pumpkin is perfectly safe for dogs to eat! Spend the Day Snuggling – Fall is a great time to stay in and cuddle up with your favorite pup! Grab a blanket, a cup of hot chocolate, and a book and enjoy the cooler evenings with your dog. Your dog will definitely enjoy spending quality time with you nestled in a cozy blanket! Your dog can also find lots of fun to be had here at BauserHaus! He will enjoy playing and socializing with other dogs and our wonderful staff members as well. Call us at (314) 961-3911 or find us online at www.bauserhaus.com to learn more about us! This entry was posted in Fun information, Tips and tagged BauserHaus, doggie daycare STL, fall activities to do with dog, fall fun with dogs, football. Bookmark the permalink.